Royal Dutch Shell plc and its partners have won three, 35-year production sharing contracts for pre-salt blocks located in the Santos Basin, offshore Brazil. Shell will pay its share of the total signing bonuses, equating for all bids, of approximately USD 100 million [BRL 332.5 million]. Plans for the blocks will then be considered by Shell and its partners. The winning bids for Shell include a block adjacent to Shell’s Gato do Mato field (Shell 80% operating, Total 20%), a now unitised area to the Sapinhoá field (Petrobras 45% operating, Shell 30%, Repsol 25%), and the new Alto deCabo Frio – West block (Shell 55% operating, Qatar Petroleum 25%, CNOOC Limited 20%). 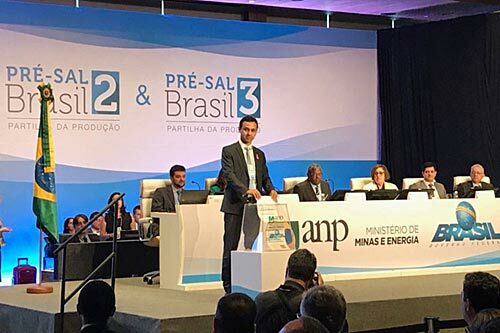 Prior to these bidding results, Shell had previously stated plans for an USD 10 billion investment into the early 2020s for its existing offshore developments in Brazil to support deep water as its Upstream growth priority. Shell first began working under a production sharing contract in Brazil in 2013 when it entered the Libra consortium, led by Petrobras. Shell’s history in Brazil covers more than 100-years with businesses in upstream and downstream. Shell pioneered deep-water exploration and production 40-years ago in the US Gulf of Mexico, and together with its partners in Brazil, the company will combine that expertise to grow its offshore production. World-wide last quarter, Shell produced more than 710-thousand barrels of oil equivalent per day (boe/d) from its deep-water business, with approximately 330-thousand boe/d production in Brazil. Other deep-water projects for Shell are in the Gulf of Mexico, offshore Nigeria, and offshore Malaysia.